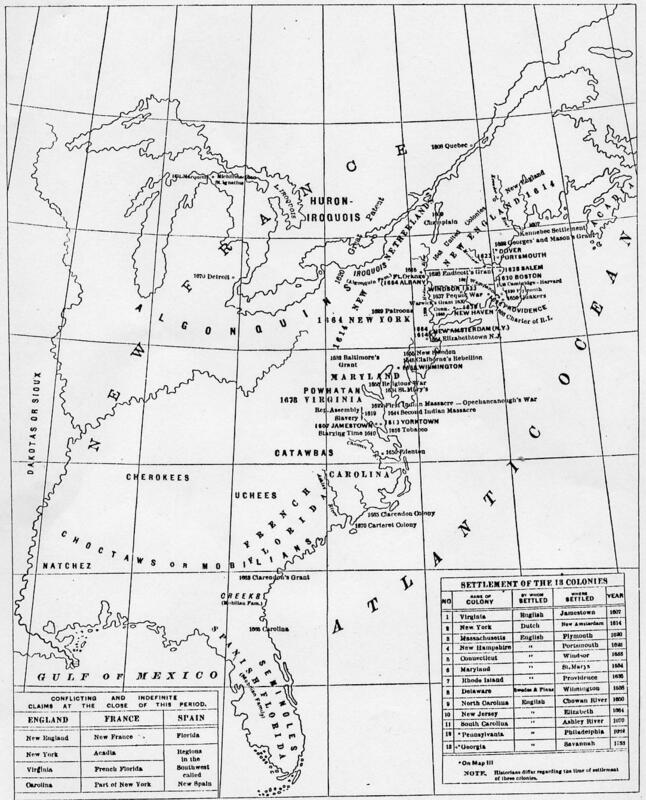 Shows outline of Tribe locations in the United State early 1700's No Rivers or Towns/Villages shown. Shows outline of the old Colonial syatem 1700 of the British, French, Spain. No Rivers or Towns/Villages shown. 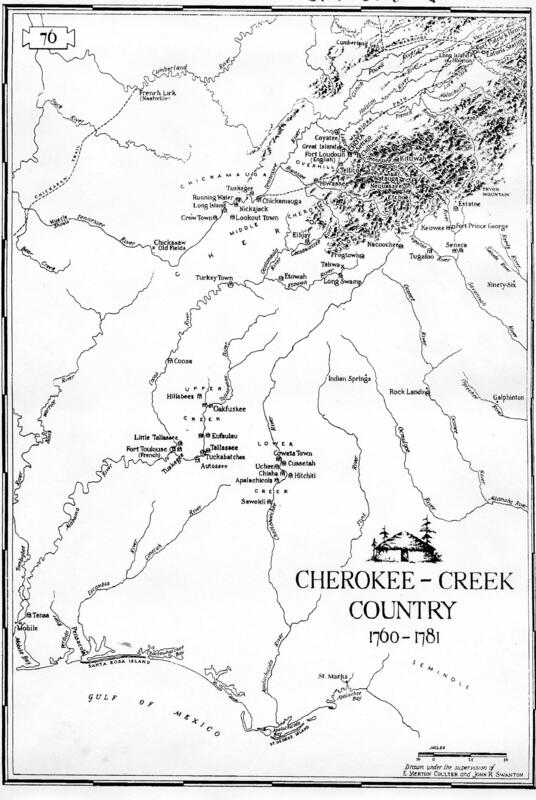 Shows outline of the Cherokee Nation prior to American Revolution; No Rivers or Towns/Villages shown. 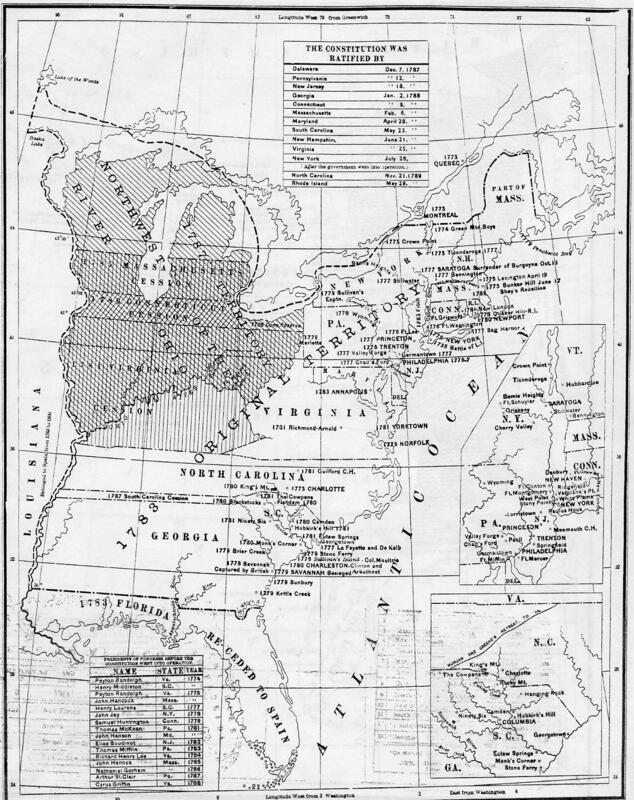 Map East of Mississippi River of Settlements, 13 Colonies, listing Native American Indian Nations, with date of Colonies. 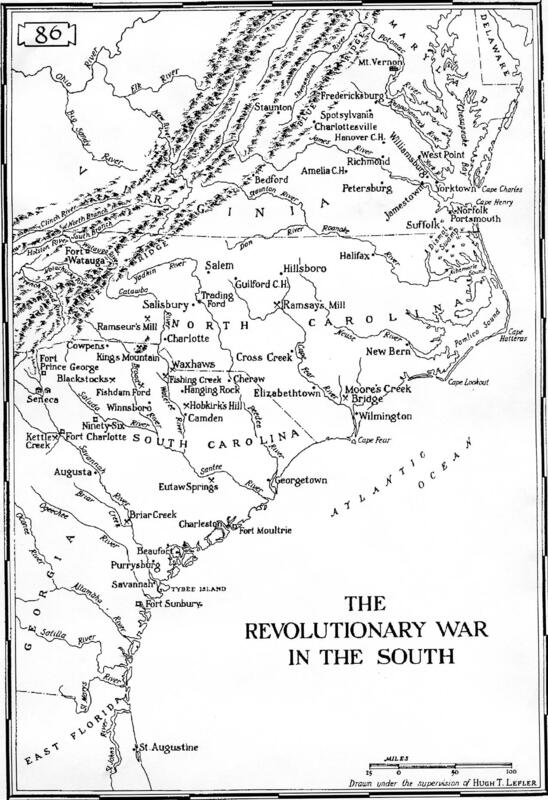 Map East of Mississippi River of Inter - Colonial Wars; Kinds of Government in the 13 Colonies at the close of 1763. By Barcley McGHEE, Enlargement, showing Rivers, Towns and Villages. 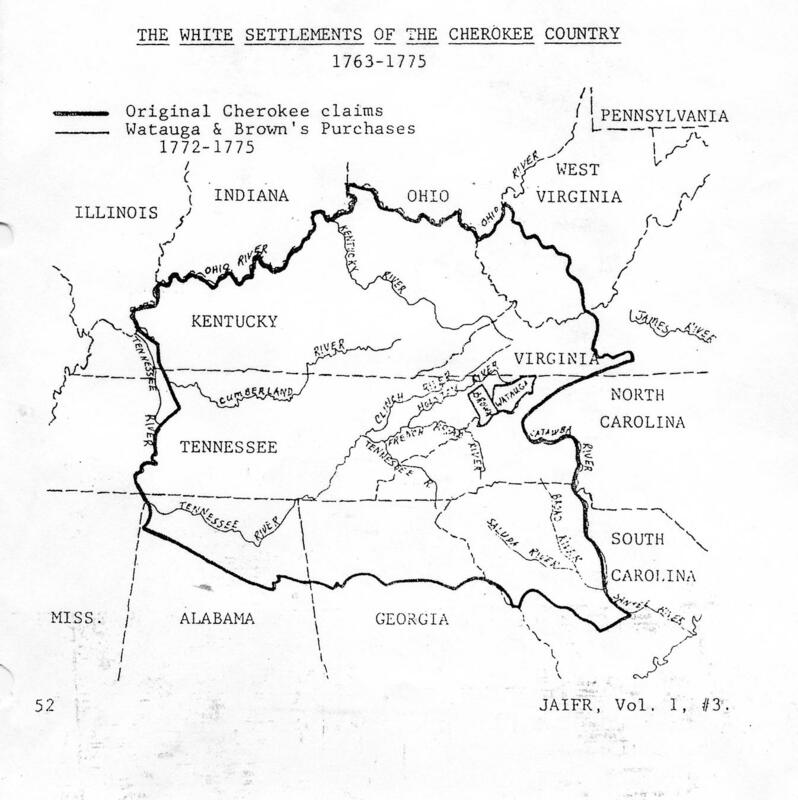 A Draught of the "Cherokee Country". 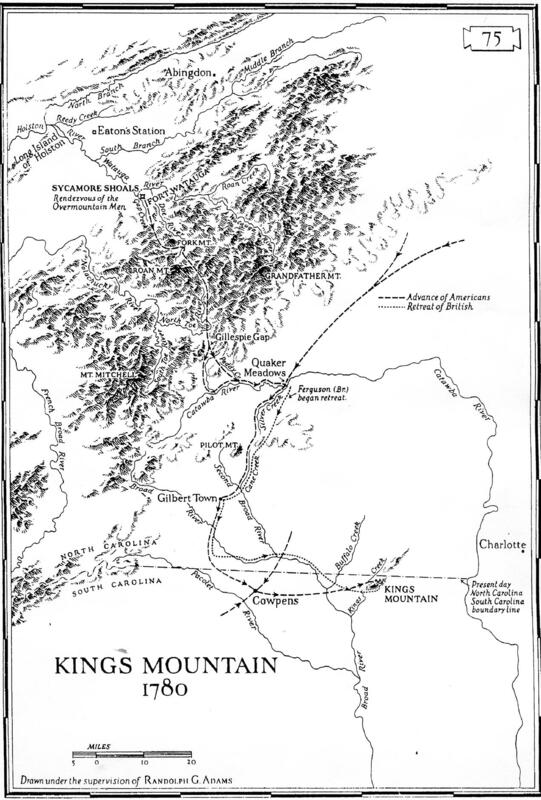 On the West side of the "Twenty Four Mountains". Commonly called "Over the Hills". Taken by Henry Timberlake when he was in that Country in March 1769. Likewise the names of the Principal or Head Men of each and what number of Fighting Men they had to send to War. 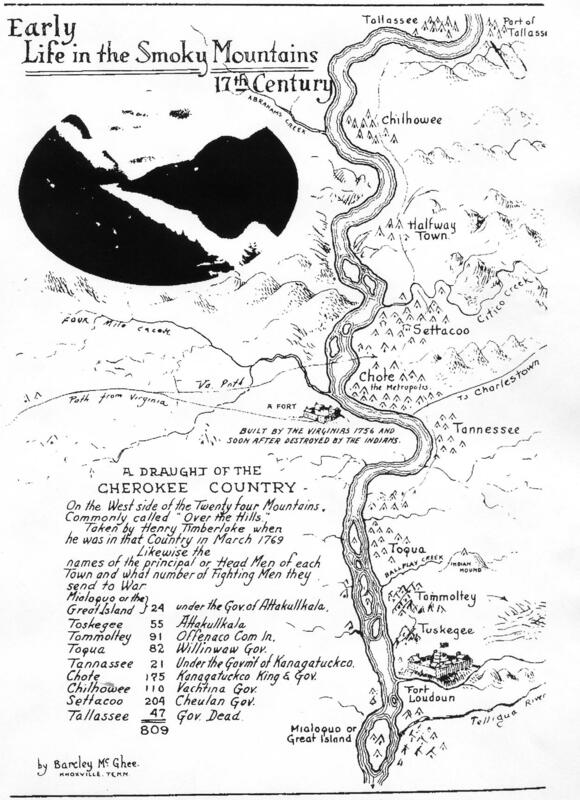 Up & down the Little Tennessee River, Monroe Co., TN., home of nearly a thousand Cherokee Warriors, in 1769. 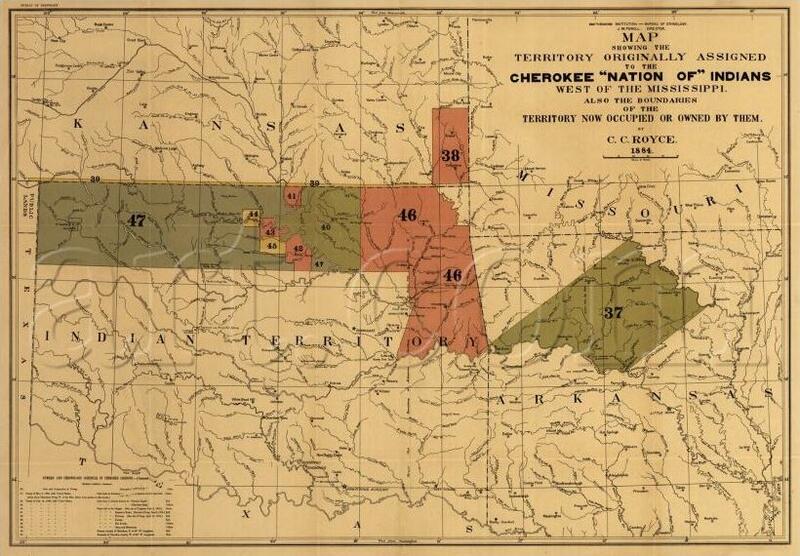 Map of original Cherokee Nation boundaries showing the "Watauga" purchase of 1772 and the "Brown's" purchase of 1775. 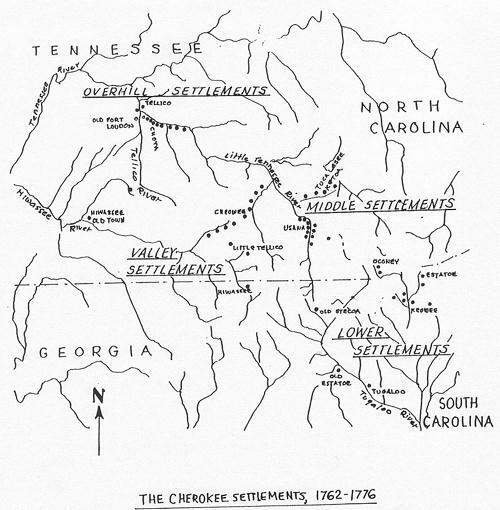 Map of East Cherokee Nation Settlements. Green's, Morgan's, Lee's, Cornwallis's & Rowden's troops. <--- See: Bio. Swanton, John Reed SWANTON, (1873-1958) Washington : U.S.G.P.O., Pub. 1952. vi, 726 p. : maps. ; 24 cm. Enlargement, showing Rivers, Towns and Villages. 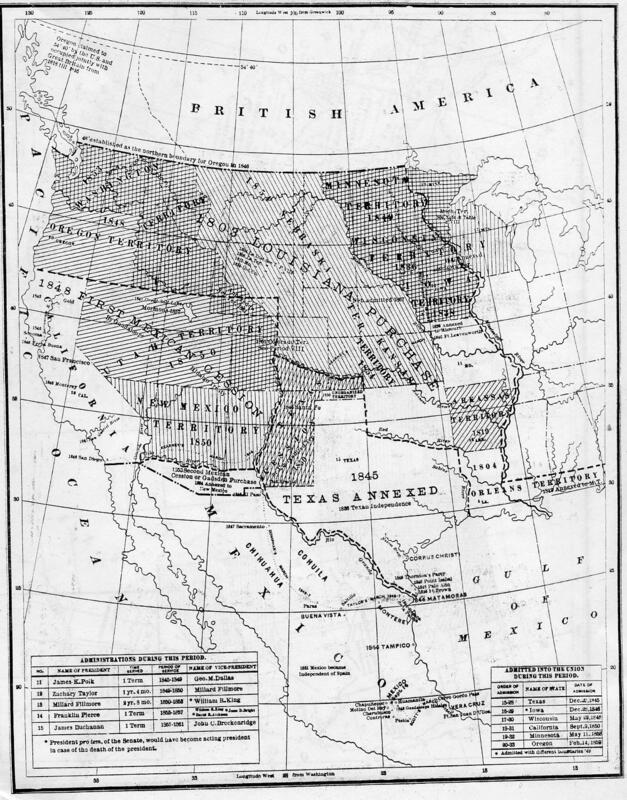 Showing the Territory held by them at various times, West of the Mississippi River. 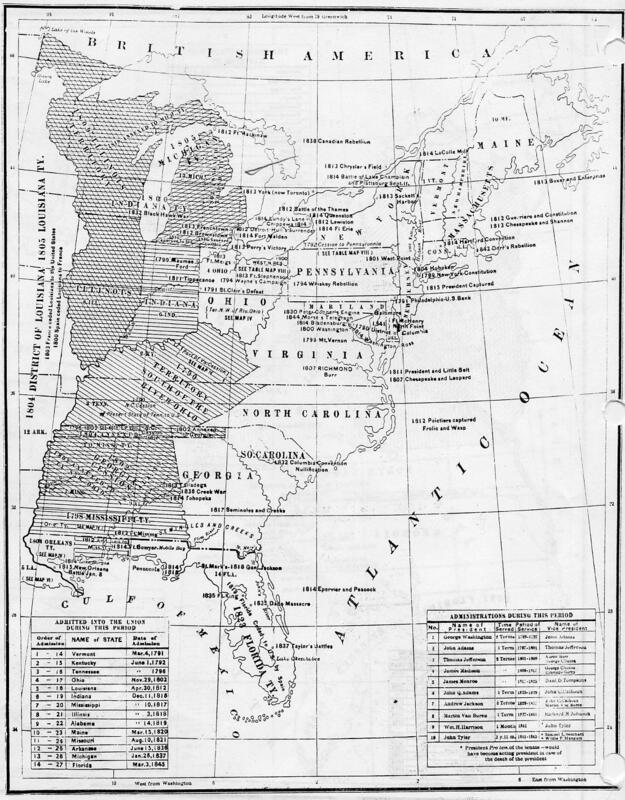 Enlargement, showing Rivers, Towns, Villages, Forts, Fortified Stations, Missions, Important Sites, Indian trails, Pioneer Roads and present-day State lines. Drawn under supervision Hugh T. LEFLER, Pg. 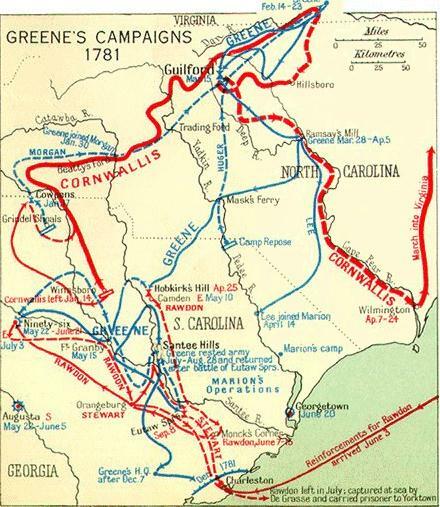 86 Enlargement, showing Rivers, Towns, Villages, Advancements of the Americans and British troops in South and North Carolina. 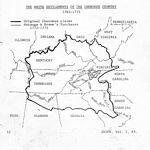 The "Wilderness Road proper began at the "Block House", but to that point converged roads's from the northeast, running down the "Shenandoah and the "Holston Valleys", and from the southeast running up the "Tadkin and Watauga" valleys." (a.k.a. 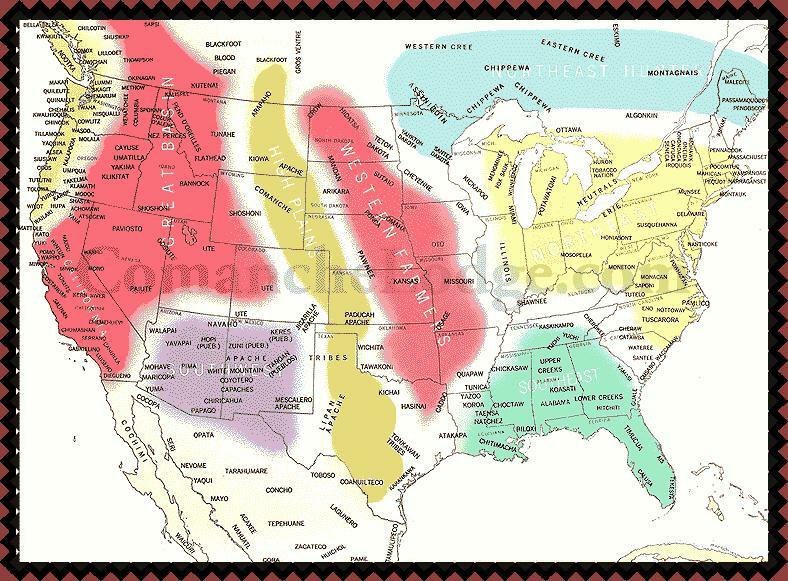 "The Path of Buffalo and Warriors"
During the 17th century, the American bison, after a 1,100 year hiatus, resumed a migratory pattern into the southeast portions of North America. Besides foraging for grazing areas, these large path- makers sought the numerous salt licks that dotted present Kentucky and Virginia, and in doing so beat out a well-defined trace. During the next two centuries travelers could follow such traces on roads extending from near Roanoke, Virginia to central Illinois. 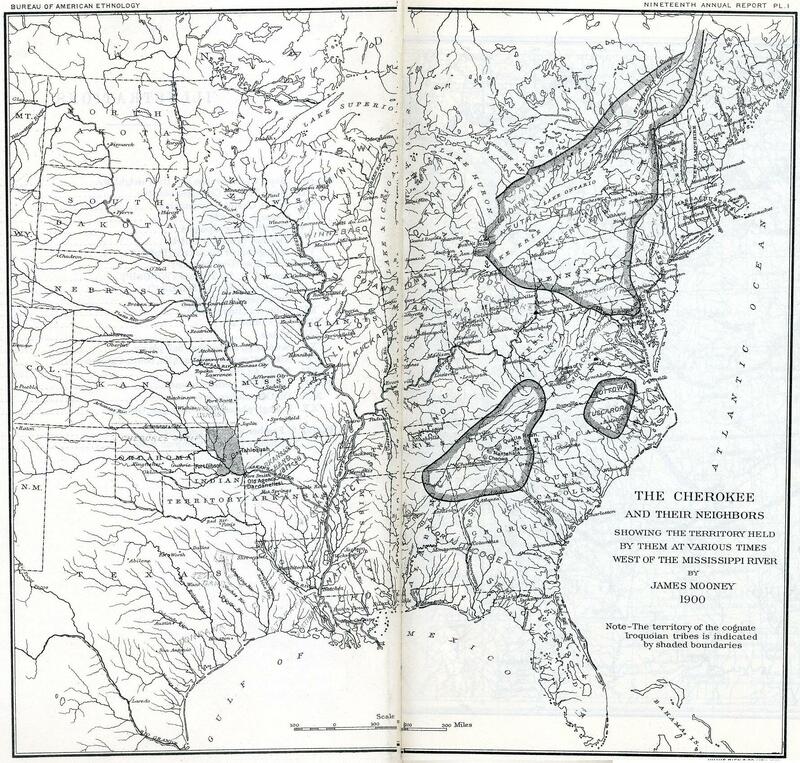 Just as this network of traces served as a corridor for native peoples, so it served the European frontiersmen and settlers who followed. 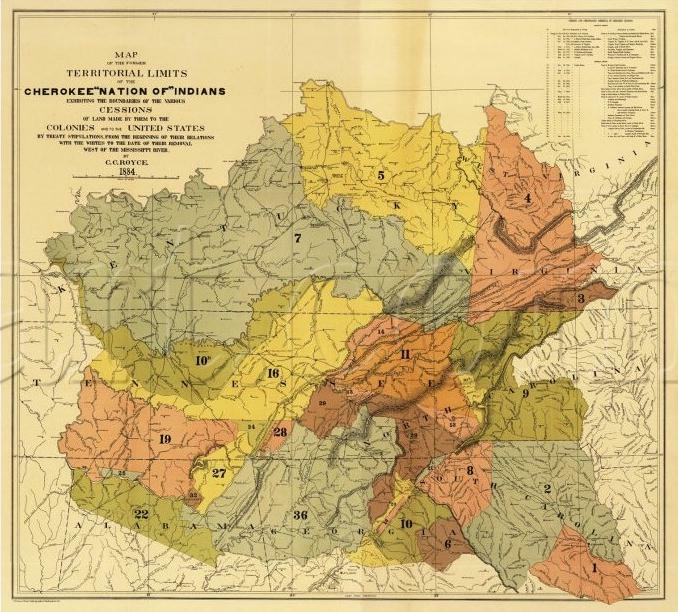 Foremost among Indian routes in the eastern United States was the Warrior's Path, which looped southward through the Cumberland Gap, connecting the Ohio valley and that of the Shenandoah and the Potomac. 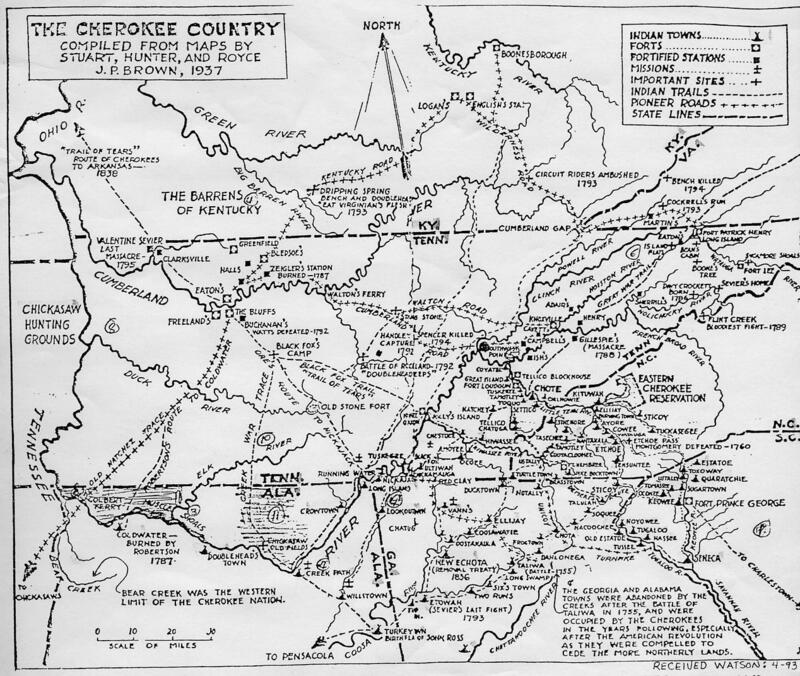 Branches of the road also continued southeast to the Cherokee and Creek settlements. 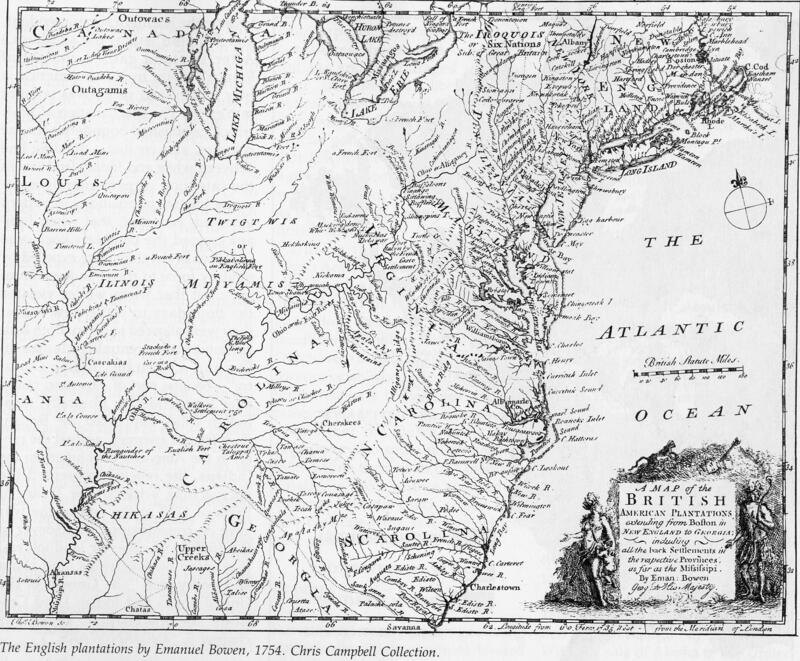 In short, the path laid down by animals and native peoples was ready to be adapted by opportunists from the colonies on the Atlantic seaboard. Early travelers included Gabriel Arthur and Dr. Thomas Walker in the 17th and 18th centuries, respectively. 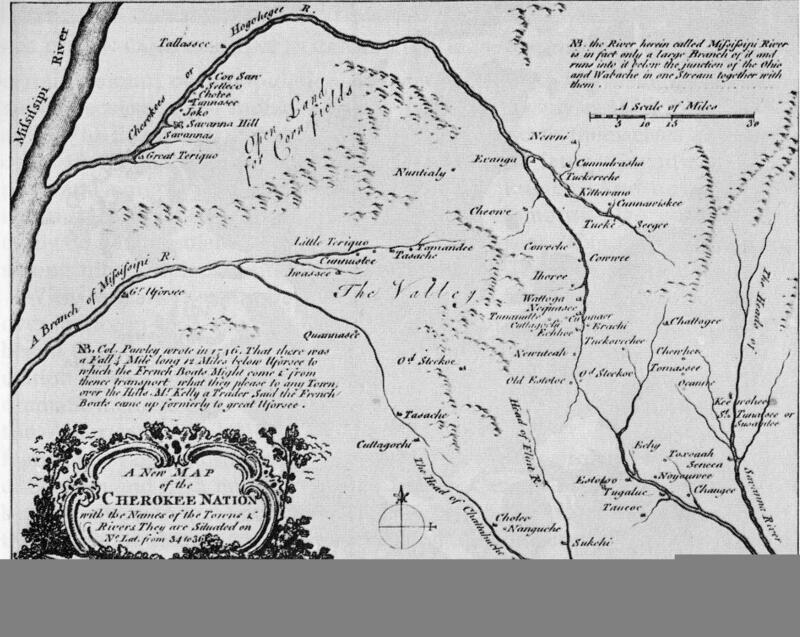 Walker's account in 1750 gives the first Anglo eyewitness description of Cumberland Gap, the entrance of the present Cudjo Caverns, the spring emanating from it, and the Indian road Walker followed. 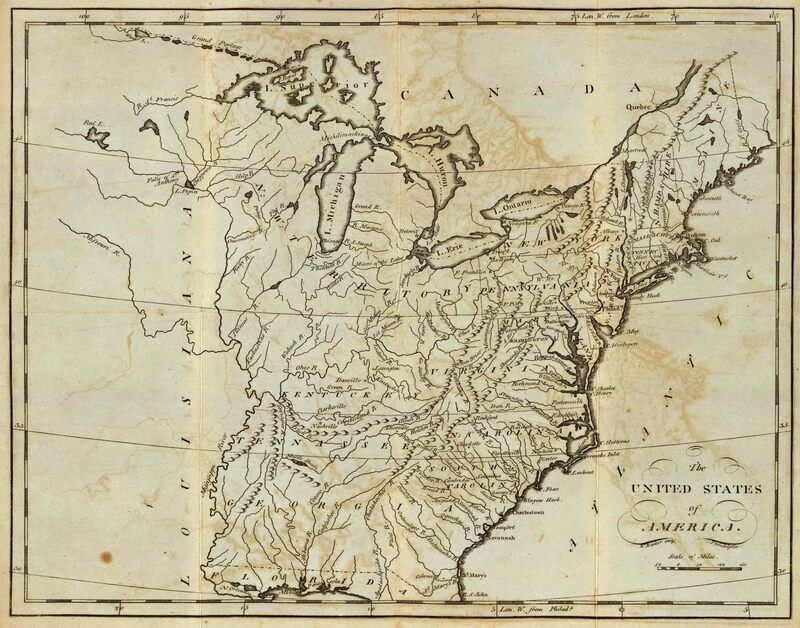 During the French and Indian War (1754-1763), exploration and travel temporarily halted. 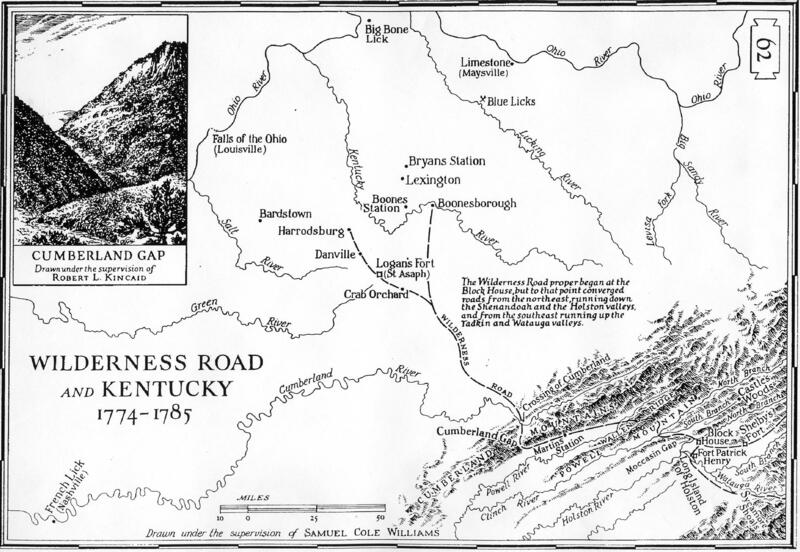 But in 1763 a group of "long hunters" led by Elisha Walden (Wallen) crossed into Kentucky through Cumberland Gap. Success of the hunt brought others to Kentucky, including Daniel Boone, the individual most identified with the Gap, who traversed it in 1769. 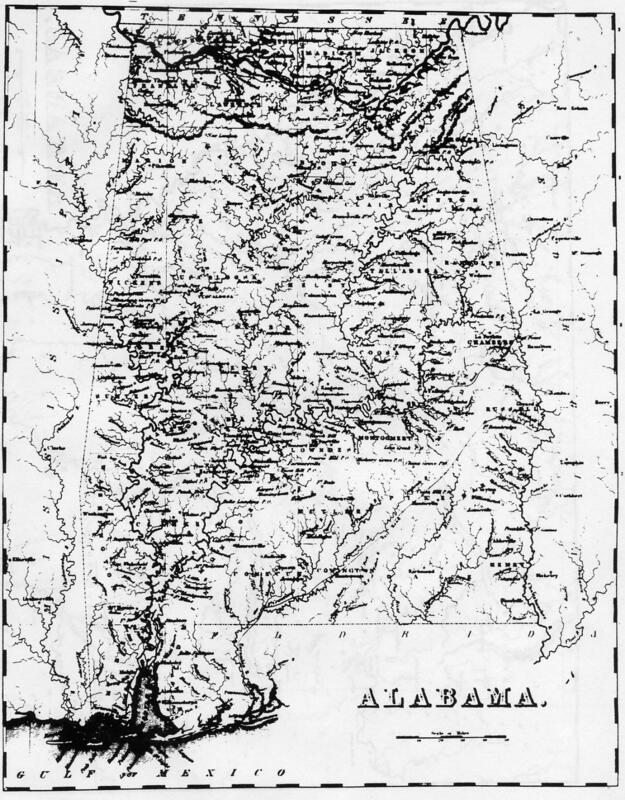 Map East of Mississippi River, showing territories and "Cession" dates for the period of 1774 to 1788.
by W. Barker, Philadelphia, Penn. 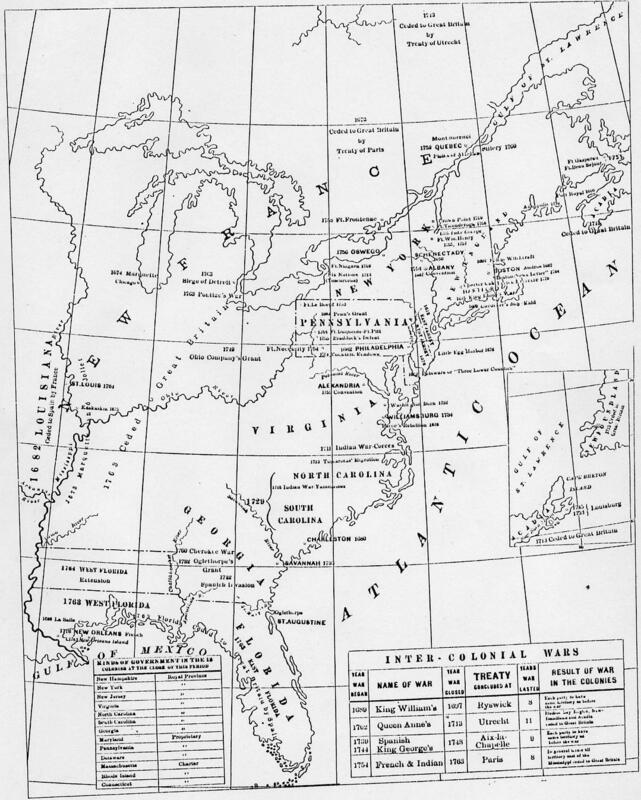 East of the Mississippi River, with Latitude & Longitude; Rivers & Streams. 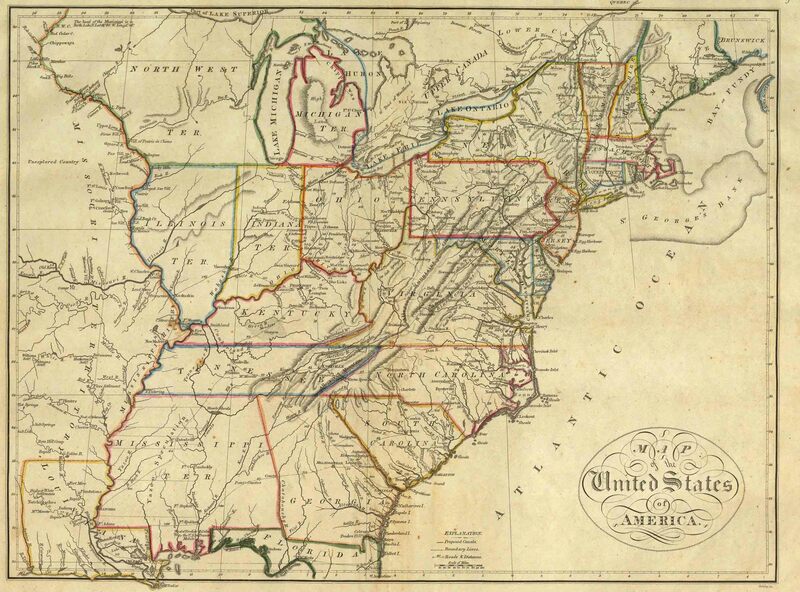 East of the Mississippi River, the 13 Colonies marked in color, with Latitude & Longitude; Rivers & Streams. 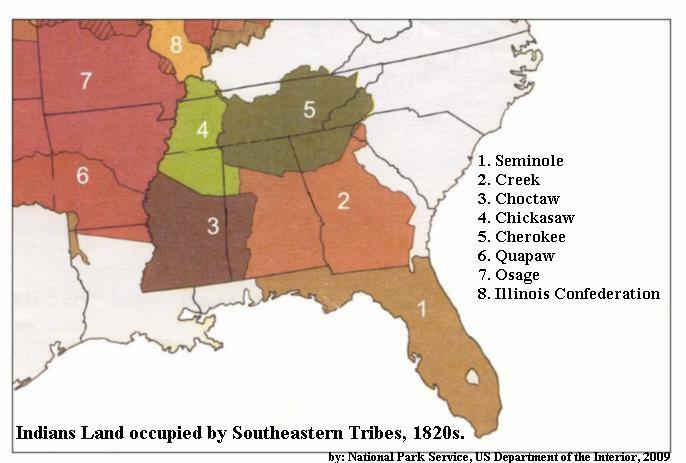 Indian Lands occupied by the Southeastern Tribes. By H.C. Carey & I. Lea, Phildelphia 1823. 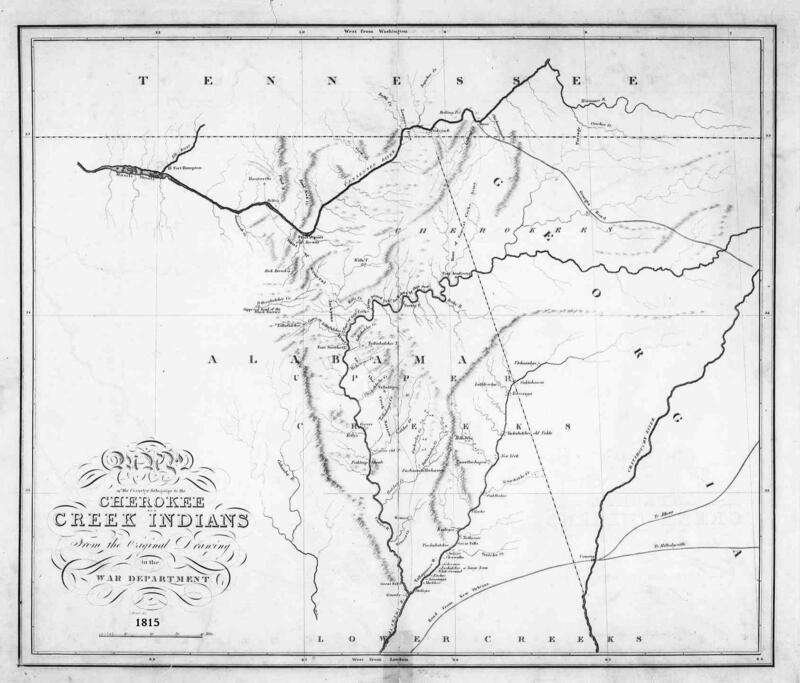 Map showing the boundaries after the 1824 Act of Congress which was a clear violation of the Treaty of Doak's Stand 1820, where about 1,000 CHOCTAW moved from their ancestral homes East of the Mississippi to West of the Mississippi in the then Arkansas Territory. 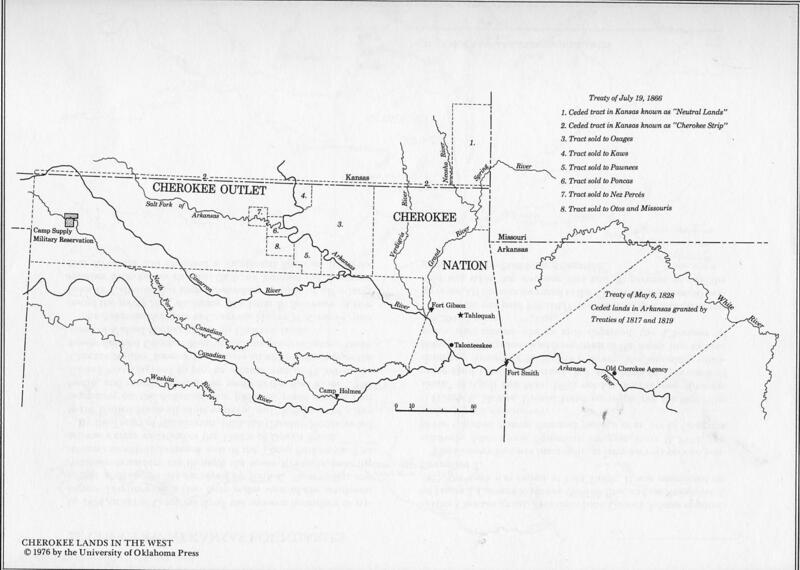 This provided a new Eastern boundary for the CHOCTAW settlements on a line extending North from the mouth of the Little River to the Arkansas River. 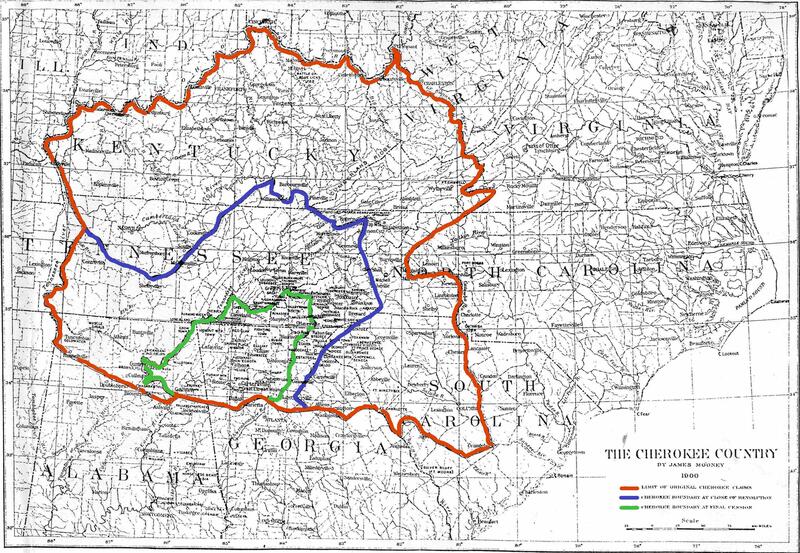 Map of the 5 Civilized Tribes and their "Emigrating" routes. 1. 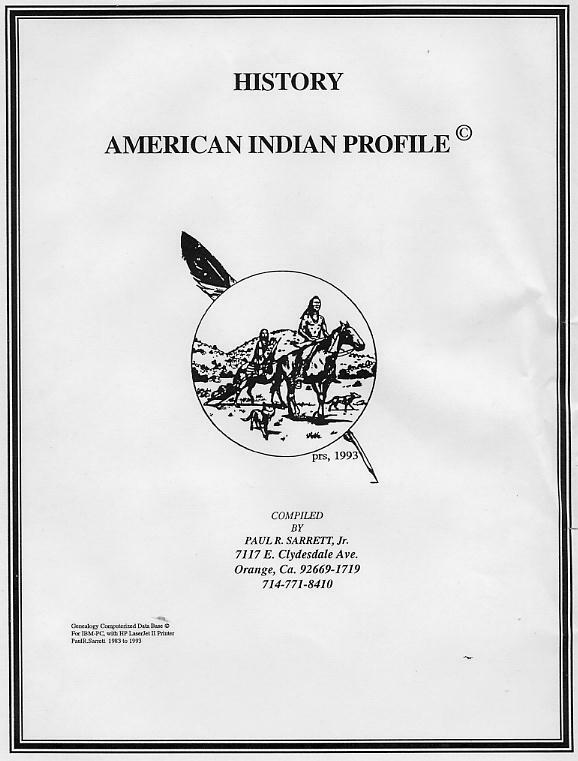 Choctaw; 2. 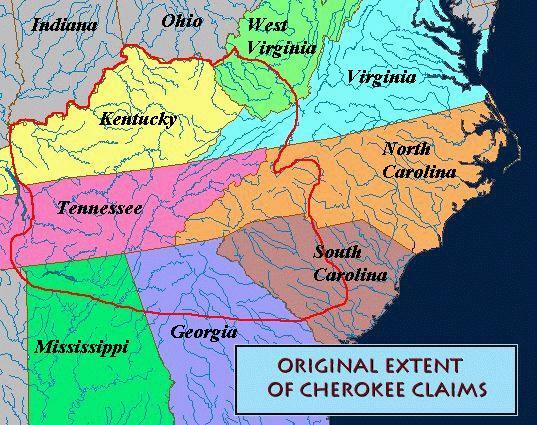 Cherokee; 3. Creek; 4. 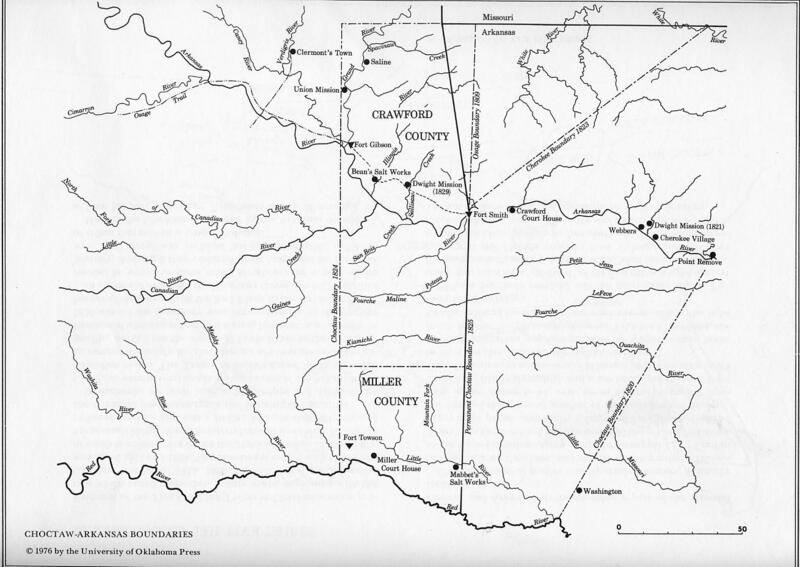 Chickasaw; 5. Seminole. 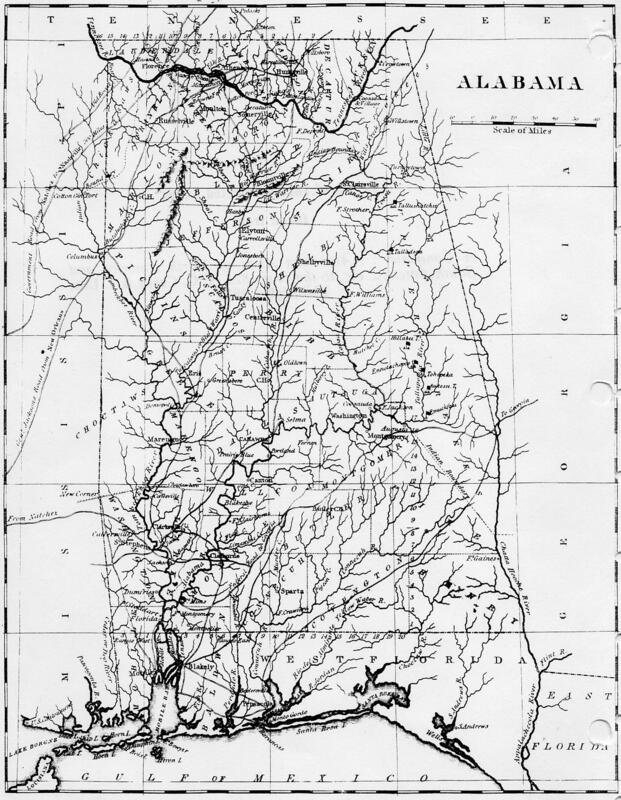 Map East of Mississippi River, showing territories and "Cession" dates for the period of 1791 to 1845. 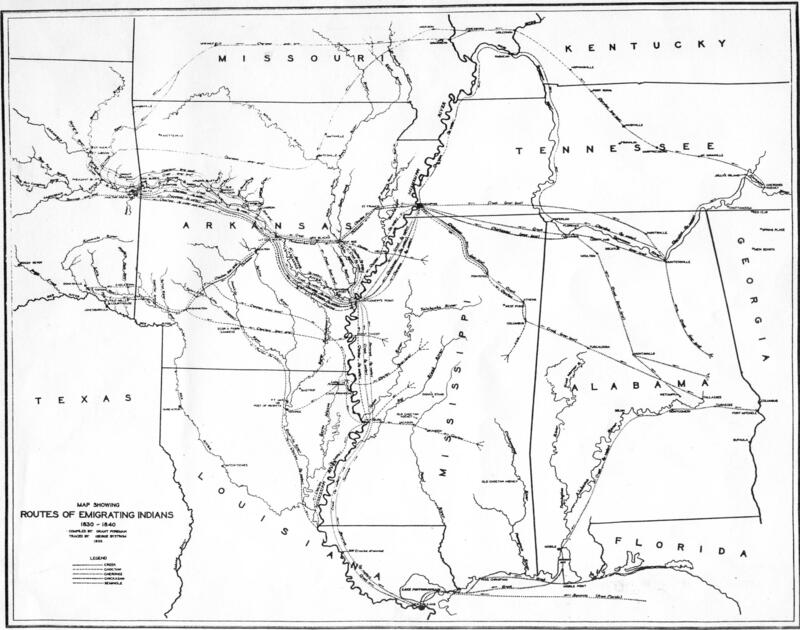 Map West of Mississippi River, showing territories and "Cession" dates for the period of 1845 to 1859. Also the boundaries of the Territory Now Occupied or Owned by them. <---E-Mail Paul R. Sarrett, Jr. Auburn, CA.